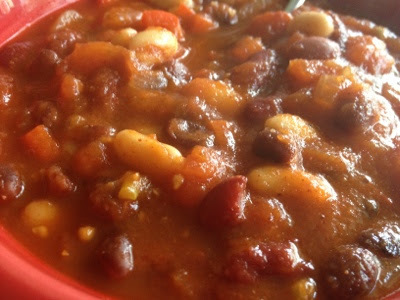 People have been asking me to share my recipe for vegetarian chili, and I'm finally getting around to doing so. This is probably the most often made meal in our home. Even my carnivore teenage son loves it (but I have to run the blender through it to get rid of the "chunks" before he'll eat it). When you blend this chili with an immersion blender or food processor it makes a great topping for fries! In a dutch oven or large pot heat oil, then add onions and peppers. Cook for about 5 minutes, then add garlic. Cook for about a minute, then add beans, tomatoes, water, chili powder, salt & pepper. Bring to boil, reduce to simmer and cook for 30 minutes. You can't have chili without cornbread, so plan to make some of that too. Maybe I'll share a cornbread recipe next time.